If you're looking for a healthy, crunchy treat than Snicky Snaks Organic Sweet Potato Pie dog treats are a great choice. These crunchy treats are baked with high quality ingredients such as organic sweet potatoes that are 100% USDA Certified Organic. That means the ingredients are grown without the use of the use of pesticides, synthetic fertilizers, or GMOs. These all-natural treats also do not contain added sugar, salt, preservatives or artificial colors and flavors. 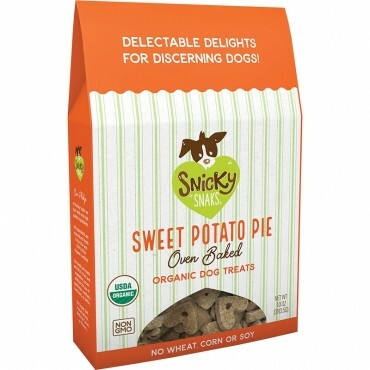 You can definitely feel good about treating your dog to a Snicky Snaks Organic Sweet Potato Pie treat! Organic sweet potatoes provide a healthy dose of beta-carotene, fiber, Vitamin C and other vitamins and minerals. In addition organic sweet potatoes are not only grown without the use of pesticides and synthetic fertilizers, but they are also low in calories which helps your dog from putting on those extra pounds. 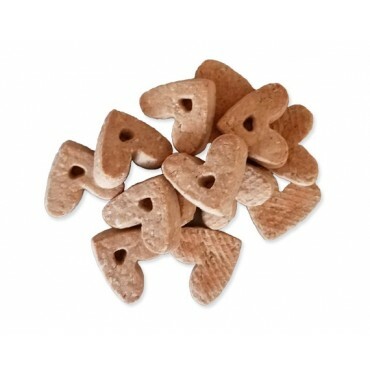 These heart-shaped treats are about 1 inch in length.